This week for After School Adventures, I planned an Afternoon of the Paper Bag Monsters. With the recent release of Where the Wild Things Are, I thought it'd be perfect timing. This program was for K-2nd graders and we shared books about monsters and then made paper bag monster puppets. 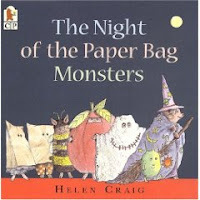 Night of the Paper Bag Monsters by Helen Craig. Which, sadly, is out of print. If you can track it down, I recommend it - it was a favorite of mine when I was a wee one. And because some libraries tend to avoid holiday books for programs, I'll mention that this is a Halloween book. 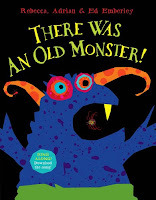 There Was an Old Monster by Rebecca, Aidan, and Ed Emberly. This is a new one, out this summer, and it's silly and gross and has a surprise ending. Plus, it can be sung if you feel so inclined. Perfect! After the stories, we made paper bag monster puppets out of brown paper lunch bags and all the odds and ends I could scare up from our program supplies (heh heh). I love this craft because it doesn't require a lot of prep and it does encourage a lot of creativity. We used crayons, feather, scrap paper, and google eyes. Now, I have to be perfectly honest with you and tell you that only one kid showed up for this program. It was kind of a bummer, especially since it was the last in a series of six After School Adventures, but sometimes that happens. We still had a good time and I thought the books were too good not to share with y'all. It might have been better as a standalone program to go with the release of the movie, but we have been having low attendance at lots of our school age programs this fall, so I'm not sure what's up with that. I just posted a review of "I Need My Monster" by Amanda Noll. It's on the scarier side, but the illustrations are awesome.